...contained this much dirt! 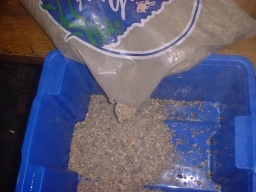 Rinse small batches of gravel two or three times. 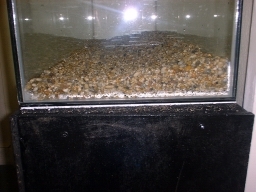 Lay the gravel out on the base of the tank, using a cup or similar to lay it gently. 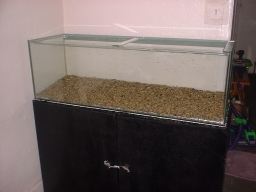 If dropped from a height, gravel can scratch or damage the tank. I prefer to make a slope front to back, so the fish are visible at the front and there is plenty of gravel to anchor plants at the back. Fill with water. I prefer to empty the first few buckets gently by syphon so as not to disturb the gravel. After it's about half full you can tip it in carefully. 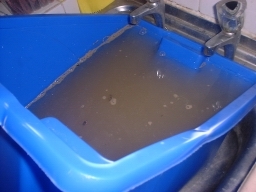 When full add a dechlorinator such as Aquasafe. My onion plant has grown leaves 4ft long! 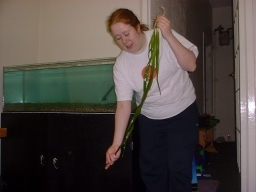 Here I am preparing to transplant it to this tank. Also, note the blue coloured water from the dechlorinator treatment. 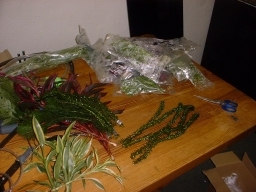 I prefer to buy an economy selection of plants from Java-Plants, which contain a variety of plants. Wash them and trim the stem of those with no roots. 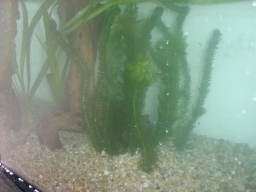 I have arranged bogwood and plants in a display to hide the filter inlet/outlet pipes. Two large bushy plants hide the heater. Along the side I have a row of plants to provide shelter and security for the fish, as this side is exposed to passers by. My final planted tank! Looks great. I tidy all my electrics into a cheap bucket, because the filter is also in the cabinet below the tank. 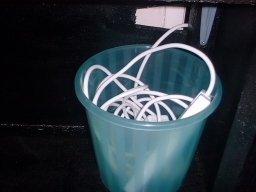 If there is any spillage, water will not reach the electrics in the bucket! 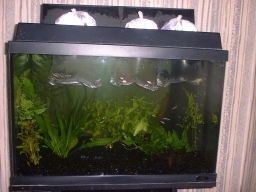 Now turn on the filter and heater to let them run and clear the water. 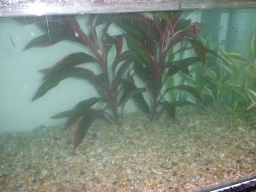 Then you need to establish the nitrogen cycle in the tank, either by adding hardy fish or the "fishless" method. 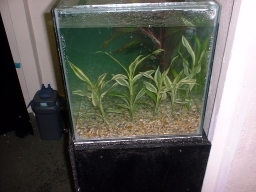 Information on maturing the tank is available at The Krib or if you have a friend with an established tank you can try my method of beating the cycle to speed things up. 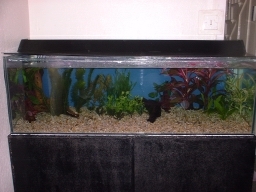 Do not simply add fish to a new tank. 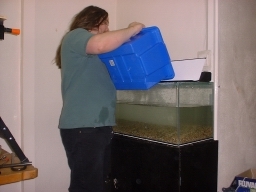 Always ensure the tank is fully cycled and add fish slowly so the load on the filter is stepped up gradually. Eventually you can add fish! 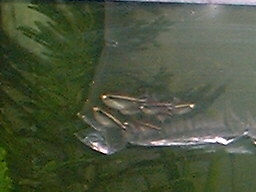 To acclimatise them leave the bag floating in the water for 10 minutes, then add some tank water to the bag. After another 10 minutes you can net and release the fish. The water in the bag should be thrown away.